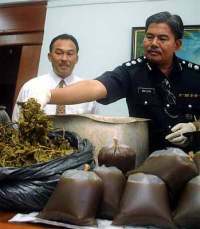 Ketum leaves and a drink made from them which have been seized by the police. Ketum belongs to the same family as the coffee plant. It grows best in swampy areas and there are two varieties found in Malaysia – one with a red midrib and the other with a white one (which apparently has stronger hallucinogenic effect). The plant can reach a height of 15m with a spread of 5m and the leaves are dark glossy green in colour. The flowers are small and yellow and look like a bishop's mitre (which gave rise to its scientific name Mitragyna). Long-term users of ketum apparently become thin and their skin darkens, particularly on the cheeks. Traditionally villagers in the north and east of the country and Southern Thailand use it to withstand the long hours toiling in the sun working in rice fields. There are quite a few ways to consume ketum. One way is to pluck the leaves and dry them in the sun. They are then crushed and ground into powder. A teaspoonful of powder is mixed with water and drunk. The powder can also be placed on the tongue for the “desired” effect. Another not so palatable-sounding process is mixing it with dried cow dung and tobacco, rolling it into a cigarette and smoking it. The leaves can also be mixed with dried coconut, ginger, onions, nutmeg and lime and rolled with daun kaduk (wild pepper leaf) and chewed like daun sirih (beetle nut leaves).